Enterprise multi store solution. Create and manage all your e-commerce stores in one central place. Get started with blugento shop factory and bring your Magento stores to a new performance level. Blugento shop factory allows you to create and manage multiple Magento stores in one place. You can create hundreds or even thousands of stores with a few clicks. Create shops for your resellers, franchisees, product lines, brands, countries or your marketing agency clients. From a single place manage all the users and their user roles for each store. You can even transfer the rights of ownership for each store if you want to sell it to another party. Soon to come is our central reporting for your stores. You will be able to see all the key performance metrics across all of your stores in one centralised dashboard. Our cloud based infrastructure and continuous integration process brings the Magento performance to a whole new level. The deployment and testing of new features is so much faster and easier. Your developers will love it. The central code repository speeds up the code maintenance and lowers the onboarding barriers for new developers in your team. Just with a few clicks you can create new versions of your stores, revert back to older versions or create backups. The blugento shop factory allows for fast experimentation. Create multiple shop variants and compare their performance. All your stores are reachable with a single click. No need to login again and again. The deployment of new features has been never faster and easier through cloud hosting and continuous integration. The management of extensions has never been easier. Manage and update your modules in one place. Book a demo with our sales team and discuss your specific needs and what the blugento shop factory can do for you. Get an overview and quick introduction about the main features. Find out how the blugento shop factory can accelerate your business. Learn how to customize blugento shop factory to your unique markets and segments. By submitting the contact form you agree to the processing of your data in accordance with our data protection declaration. After we have received your request, we will contact you quickly to agree on a term. Yes it is possible to set up the shop factory on your own servers but the implementation is more costly. Please contact us to discuss custom options. Can I run the shop factory on our servers? Yes we offer migration services. They are part of the factory setup process. Yes the factory works with both Magento 1 and 2. During the setup we will also assist you with the upgrade on Magento 2. Does it work with Magento 2? This depends on the complexity of your current setup and your customization requirements. It can take from a few days to multiple weeks. How long does it take to set up the factory? Yes the blugento shop factory works with Magento Community edition. Are you supporting Magento Community edition? Currently not. However, we can offer you a free demo session and requirements assessment. Help your clients to launch stores and scale their e-commerce activities with our shop factory. Blugento partner program is designed for agencies, consultants and companies who serve clients with advanced e-commerce needs. The blugento shop factory is designed and developed by a certified Magento development team based in Leipzig, Germany and fulfills the requirements of enterprise clients. 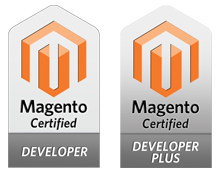 Made by certified Magento development team. © Blugento GmbH - All rights reserved.